Overview:Turn your phone into professional camera. Provides LOMO, HDR, axis shift, draft, ghost, etc. and multiple styles. No limit, no ads, all free. 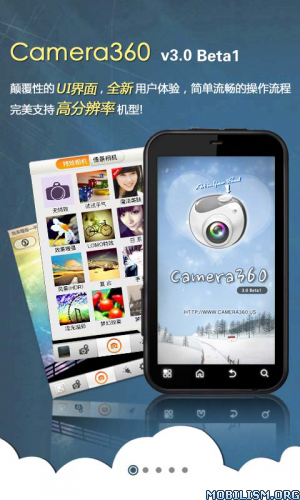 Camera360 for Android V2.7 is updated to all functions free version. * Effect like LOMO, Retro Effect, Dreamlike Effect, Art of Black and White, Back to 1839 and Night Enhancement will make your photo more beautiful. * The amazing HDR effect is even better than iPhone HDR. * Unique Funny Mode: Effects like Surrealistic B&W Paining, Vertical/Horizontal Left Symmetry, Vertical/ Horizontal Right Symmetry, Ghost are available. * Unique Scenery Mode: It takes the interesting composite photos, you can choose whether be in a movie poster, an art painting, a outdoor advertisement, or among the various types of greeting cards. * Unique Tilt-shift and Color-shift Mode allows you to see the world from another angle.